Hi folks! 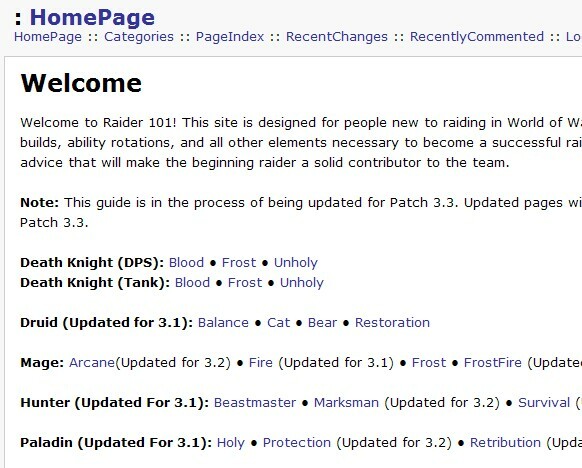 Today we’re going to explore a wonderful site that aims to be the first stop for any player who wants to learn how to play their class in a raid: Raider 101. As you can see from the screenshot of their home page, this is not a pretty site, it’s a functional site. Interestingly, it’s also a wiki style site- many of the contributions are from regular folks who have something to add. I checked through the hunter guides, and if I had had access to a site like this when I first started, I could have avoided hours of research and googling about trying to learn what precisely I should be doing. So hop on over and take a look around! If you are interested in learning how to raid, changing raiding classes, or just want to get a better idea of what all your team-mates are doing while you do your thing, this is a good comprehensive resource.